Looking for sturdy bed with classic style? Look no further than the Catalina Twin/Twin Bunk Bed in Cherry CM-BK606CH by Furniture of America. Thick carved uprights give this bed a uniquely timeless design. Made from solid wood and finished in cherry or oak finish, just add to mattress and you have all the comfort and space saving power of a bunk bed! 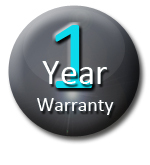 This product is warranted to be free of defects in material and workmanship for one year from the date of purchase. PlatformBedsOnline.com will at its own discretion repair or replace any defects occurring in normal usage within one(1) year. PlatformBedsOnline.com is not responsible for transportation costs, and defective items should be returned to PlatformBedsOnline.com for repair or replacement. All finishes, parts and components including beds, case goods and storage drawers are warranted to the original purchaser for one year from the date of purchase to be free of defects in material and manufacturing. PlatformBedsOnline.com will pay within one year from the date of purchase reasonable and customary labor rates to repair or replace the defective item. Warranty service is available by contacting our Customer Service Department at info@platformbedsonline.com, or by using the claims form, available by clicking here. All orders over $500 placed on PlatformBedsOnline.com ship for FREE! This item will ship curbside delivery with one of our LTL shipping partners (curbside delivery to certain areas excluded; please call for details regarding your specific delivery location). Estimated delivery time is 10-14 business days. Click here for our complete shipping policies.